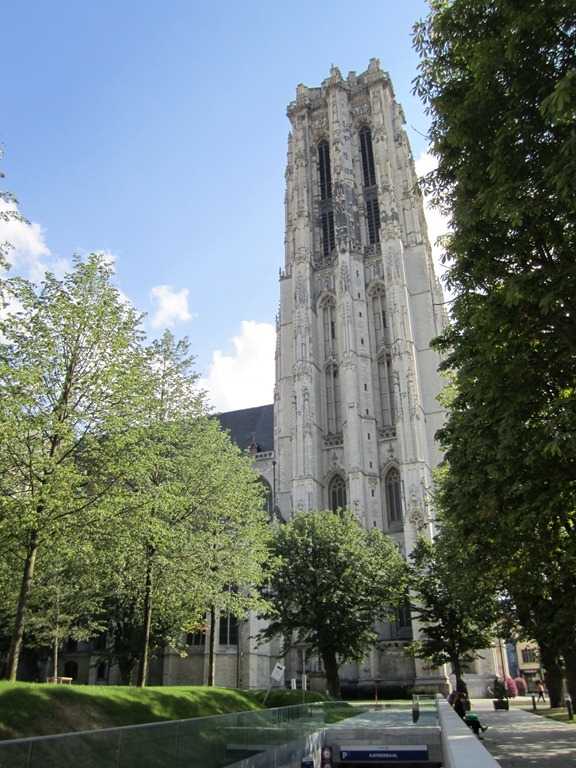 The next day, we again packed up to head from Antwerp to Mechelen. But before we left, Jack ran out to various little stores and put together a picnic brunch for us. 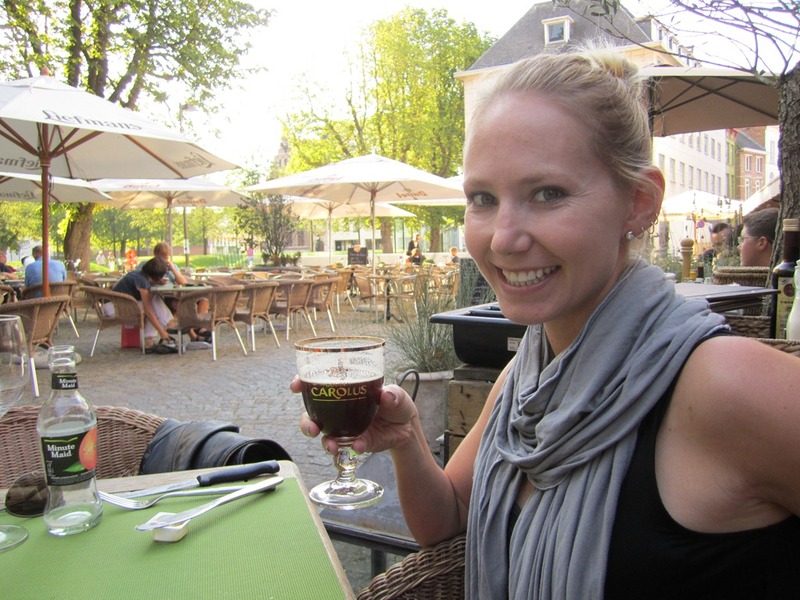 We also had a bottle of beer that we were hanging on to from Bruges, and knew we should drink it since we weren’t planning on bringing any bottles back with us. 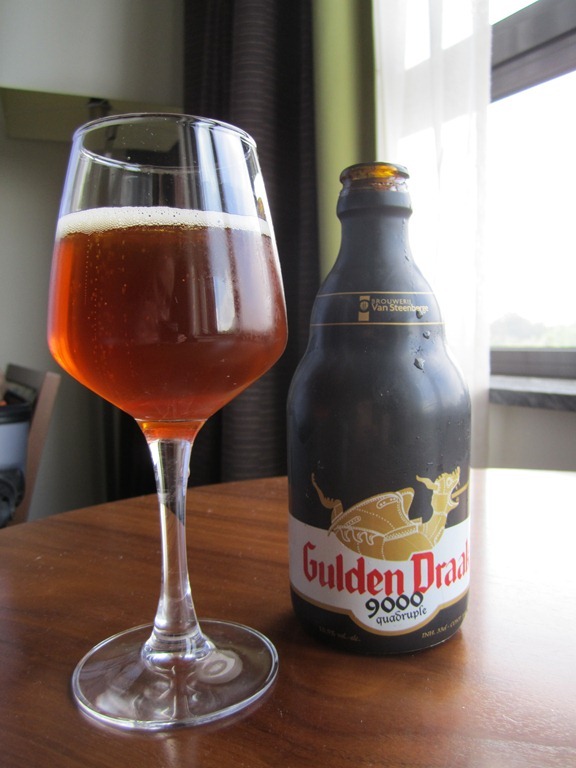 So with our brunch we split the Gouden Draak 9000 Quadruple, which at that point I had never seen available in the states, of Brouwerij Van Steenberge of Ertvelde, Belgium at 10.7% abv. 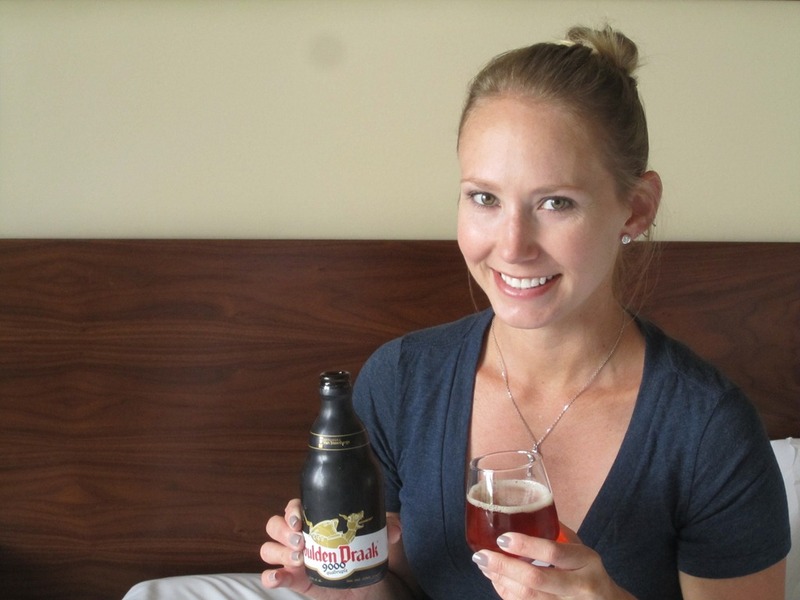 Yes, the beer pours darker than the Gouden Draak, but it still wasn’t dark and heavy enough for me to really think of it as a quad. 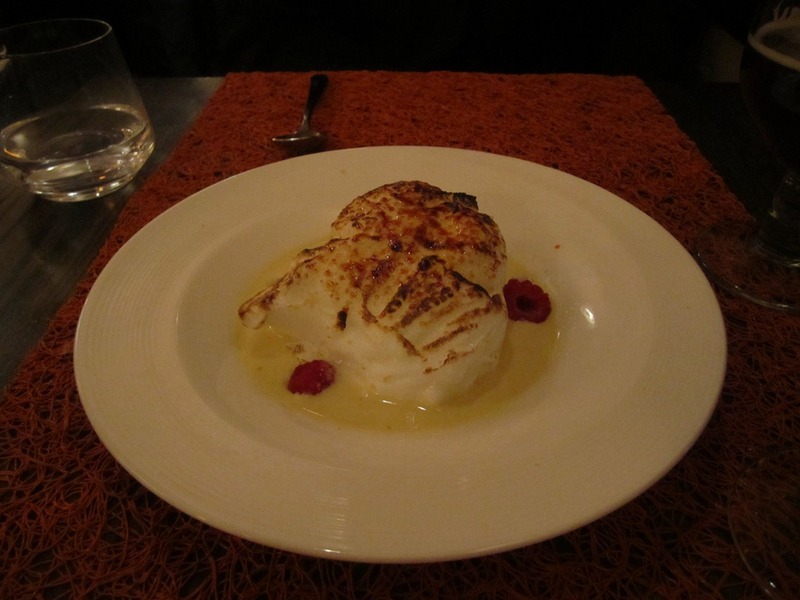 Still quite tasty though. Boozy with lots of fruit, apricots, plums, bananas. Toffee and caramel. A very good beer to pair with breakfast. 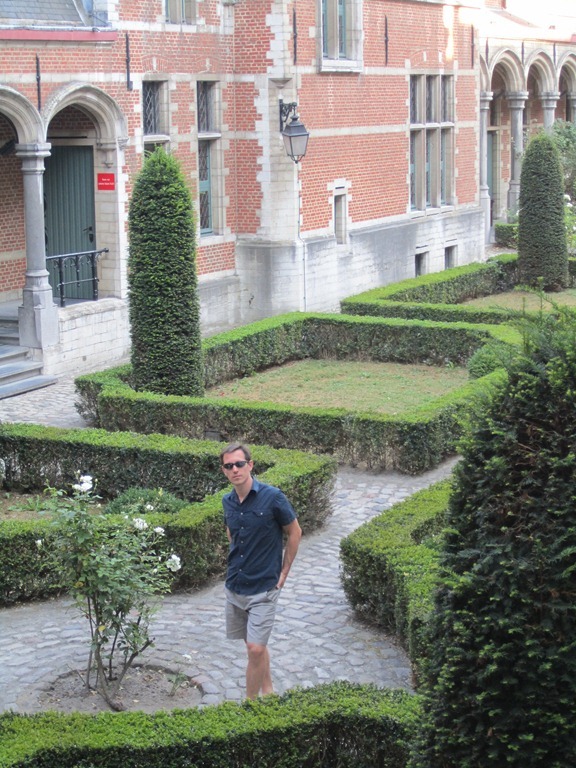 Once we checked out it was a very quick trip down to Mechelen. 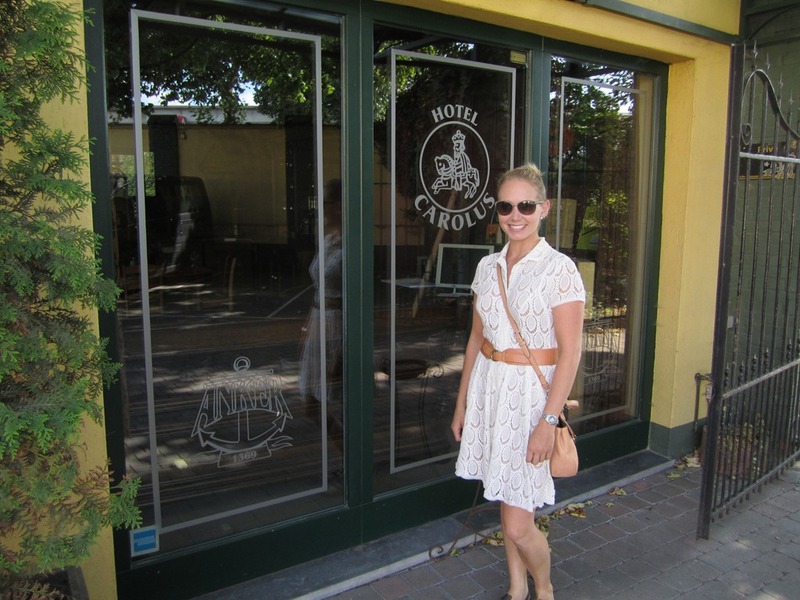 We immediately found the Gouden Carolus brewery to drop off our bags. I thought this was one of the coolest parts of the trip, we were actually staying inside the brewery! Unfortunately our tour wasn’t until the next day, but we dropped off our bags, relaxed for a bit, changed and headed back out to check out the town. 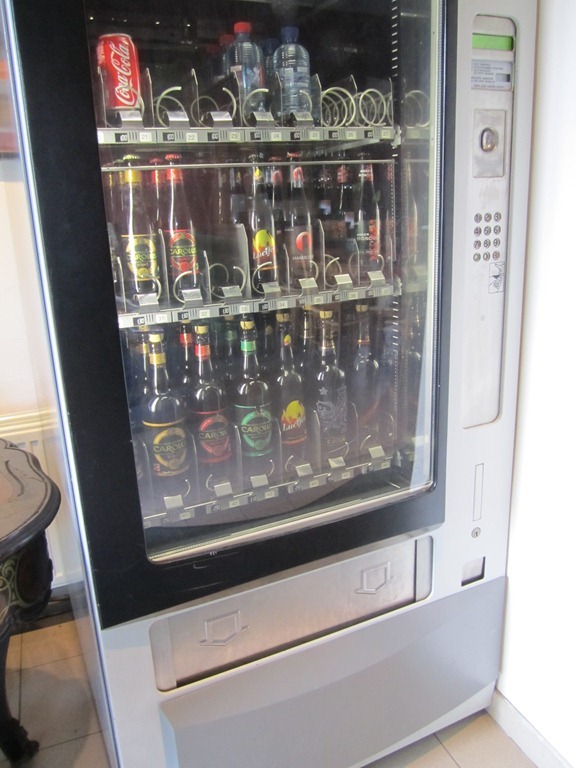 On our way out, we found a beer vending machine by the front door! I have never seen a better stocked vending machine anywhere! 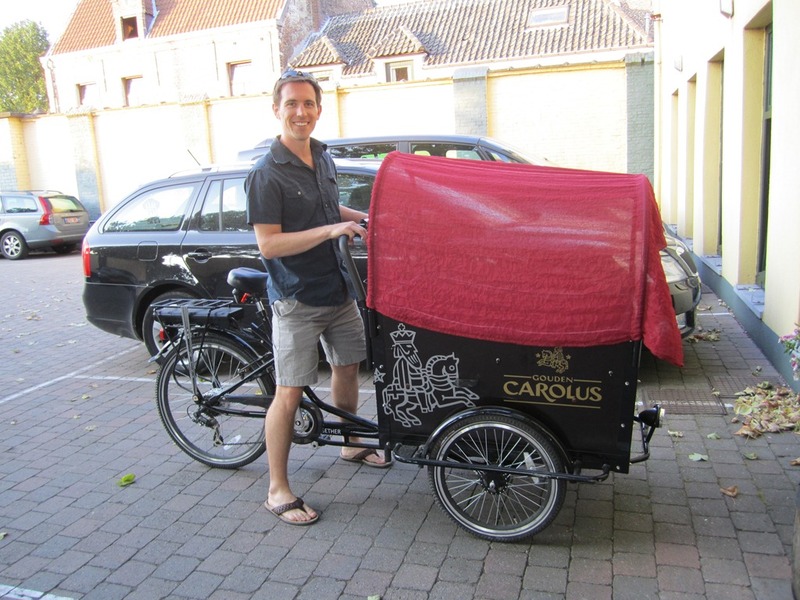 We didn’t get one, since we knew we would have a ton of Gouden Carolus beer during the tour, but it was so tempting! 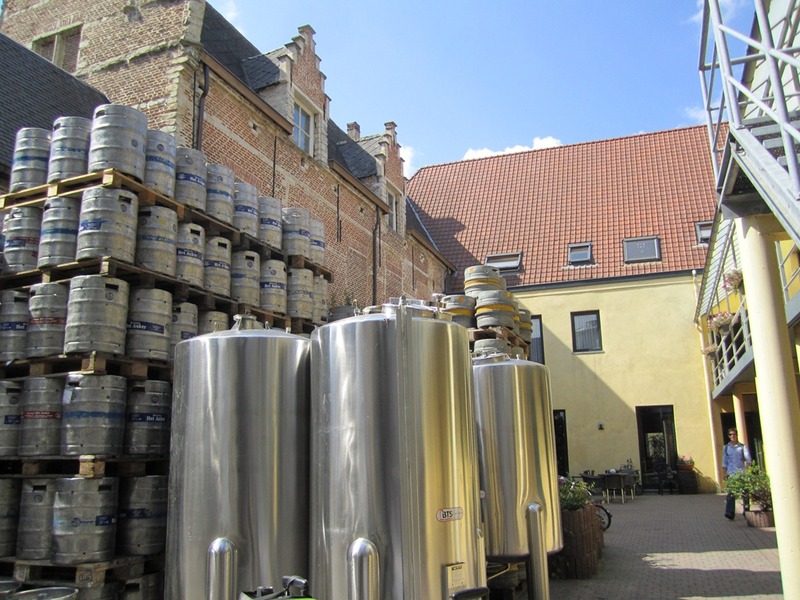 Inside the walls of Gouden Carolus were the brewery, hotel, and original farmhouse from 1625. 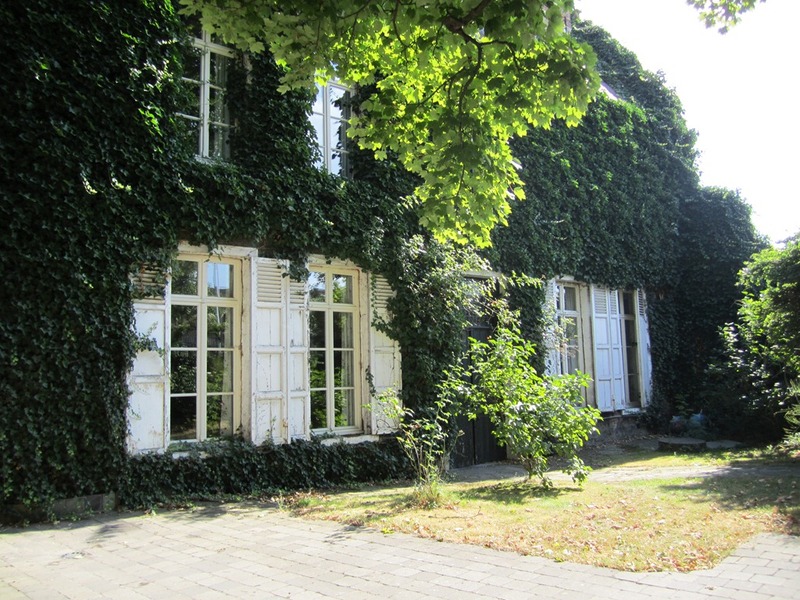 The original farmhouse, is still lived in by the owner! So no tours were available. It was so picturesque. 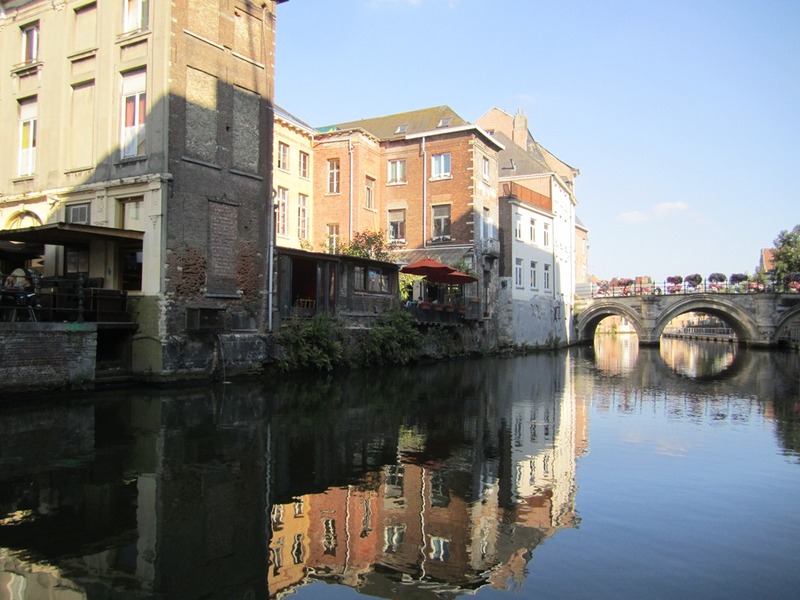 The town of Mechelen was smaller than Antwerp, but much more enjoyable. very walk able with tons of old buildings with architecture throughout the centuries. 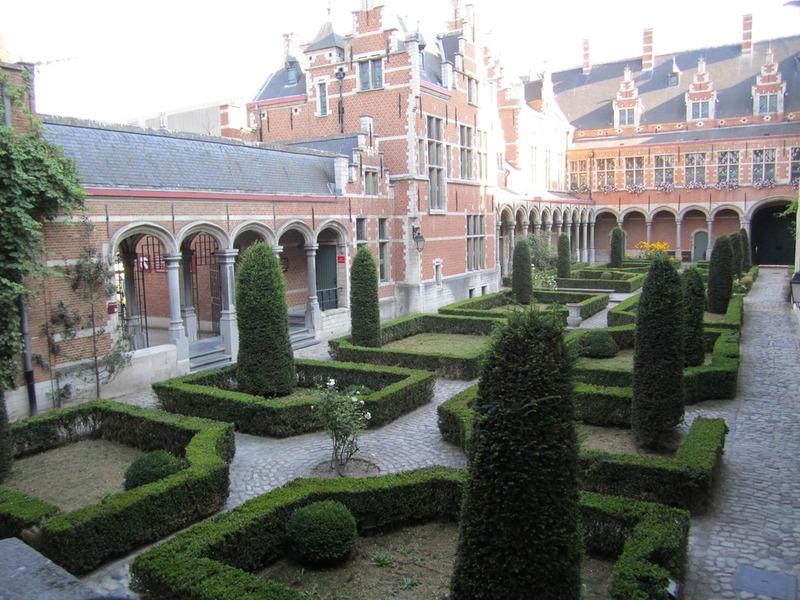 Mechelen used to be the old capital of Belgium and was also huge in the textile trade. As we were wandering around the city, we stumbled upon a little open door in a very large wall. Once we determined we could just walk around we went in. We found Margaret of Austria’s Palace. The palace was closed but the grounds were open. And for dinner we found a café right next to the bell tower. 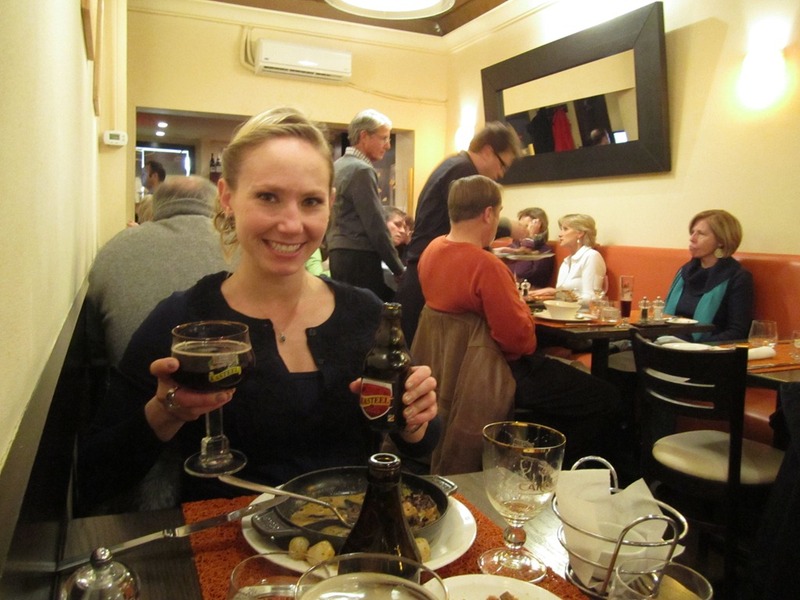 I was so excited about Gouden Carolus the next day that I got the Gouden Carolus Classic with dinner. I want! This was too cute!Jack loves biking, so I could totally see myself in the front basket! 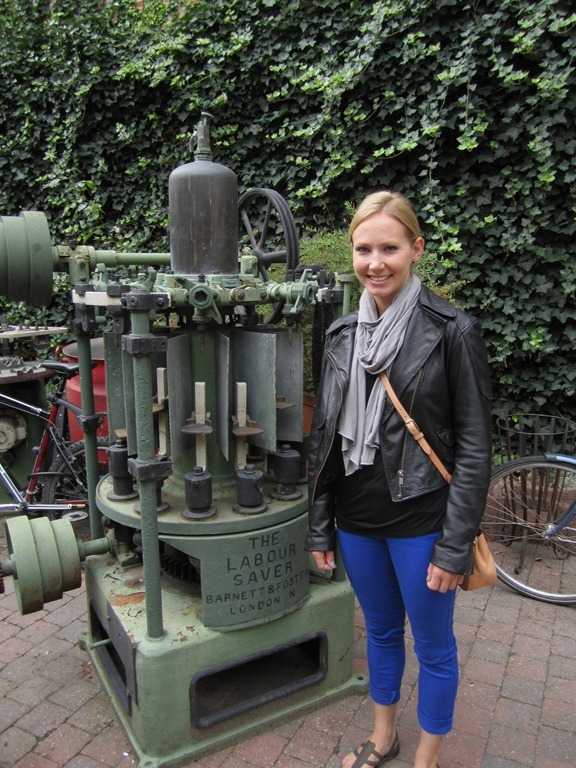 Back in the Gouden Carolus courtyard, they had tons of old brewing equipment that is no longer in use. It actually got quite chilly or else we would have walked around the town more, but it was a long day, and we knew we had to be up for the tour the next day. So we called it an early night, with all this traveling I was ready to crash. Still not a Belgium post, but this unassuming Saturday night turned into a full fledged beer fest! 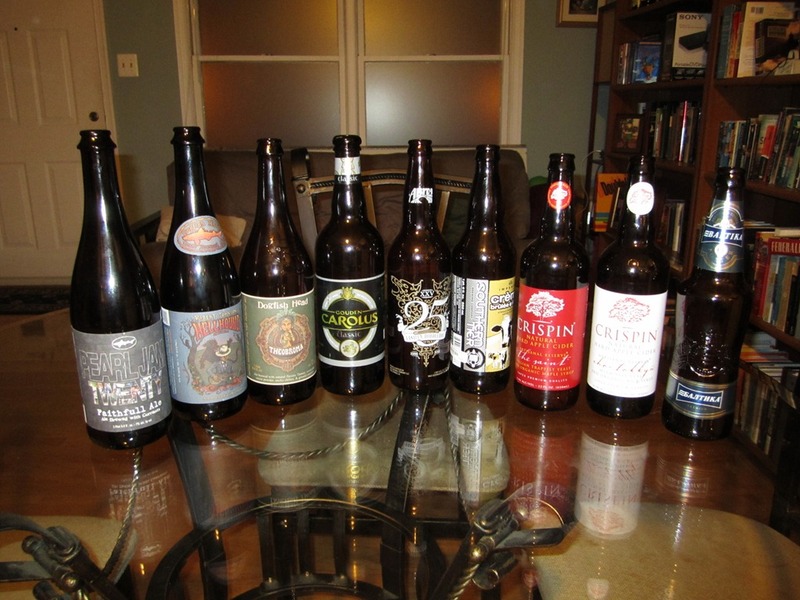 In fact, there is so much beer in this post that I am completely unable to review everything. Although, I do have tons of pictures for you to enjoy! 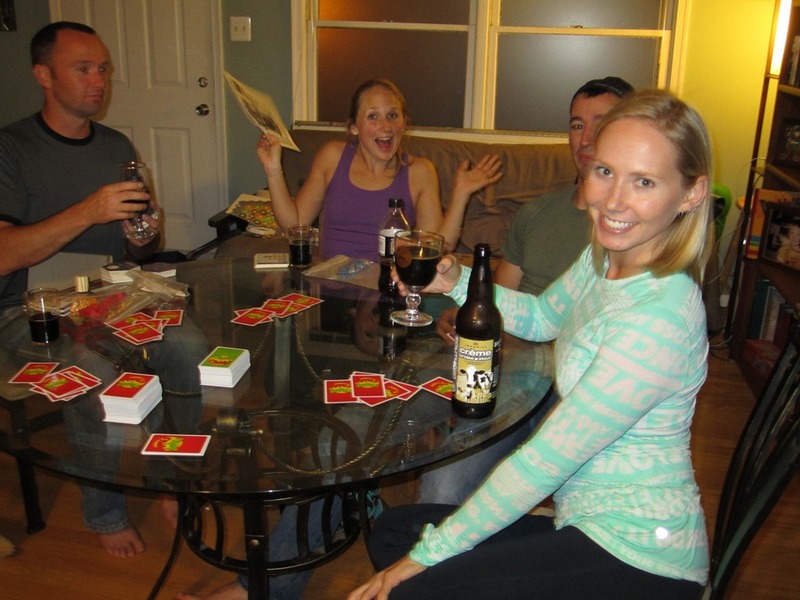 A while back, on a somewhat rainy Saturday night, Jack and I had nothing planned, so we invited over Novak, Mark, Rob and Anna for game night! 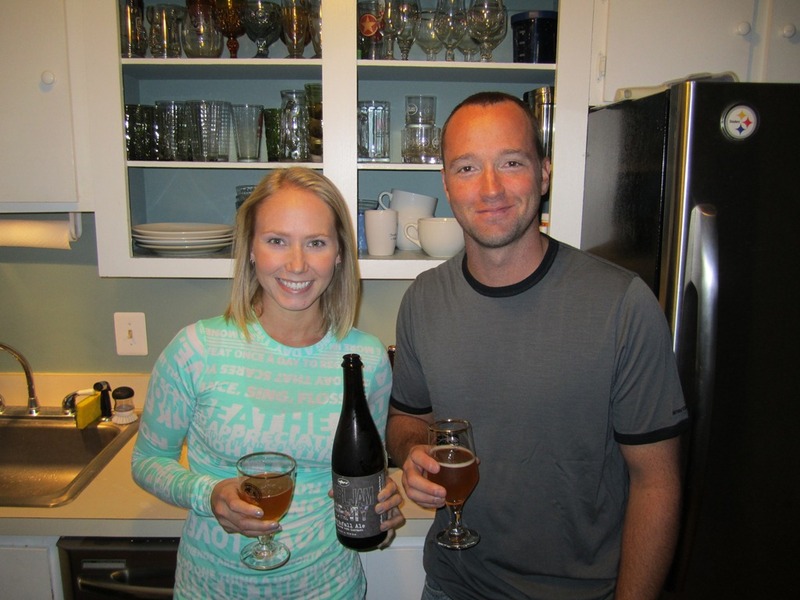 Rob and Anna had recently toured the Dogfish Head brewery and it was very kind of him to bring over multiple bottles that he picked up there! 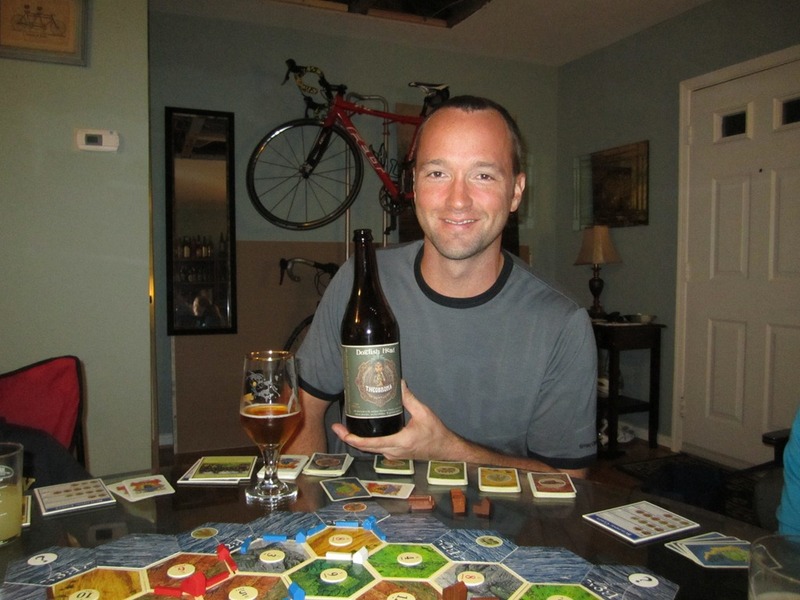 We got started with a beer and got comfortable to play Settlers of Catan. 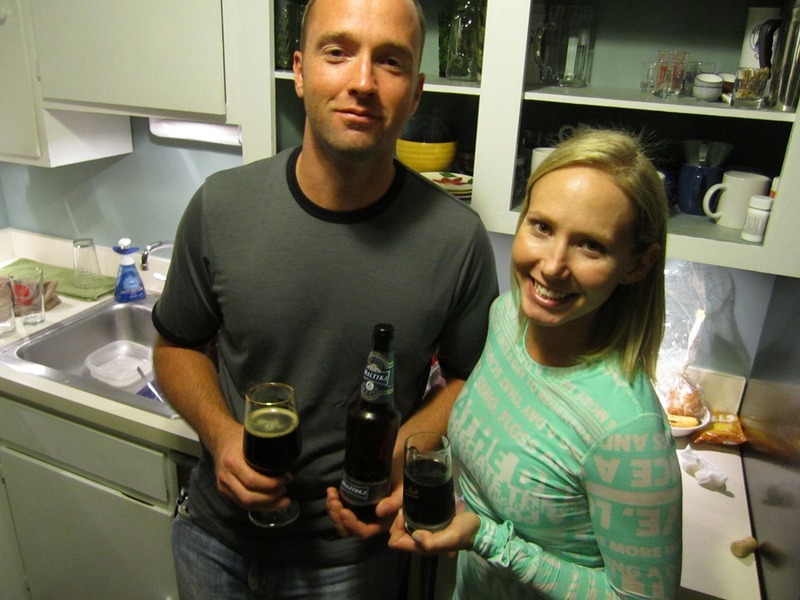 First we opened Pearl Jam Twenty Faithful Ale by Dogfish Head Brewery of Milton, DE at 7% abv. 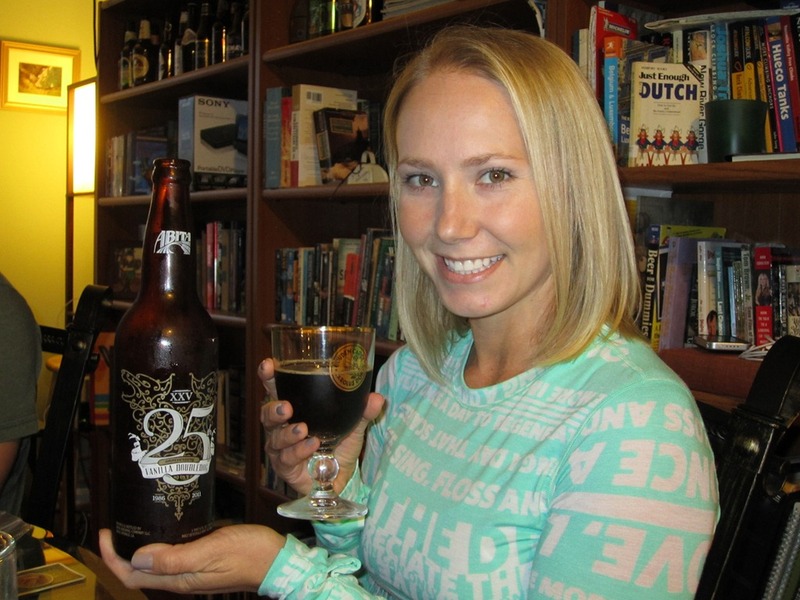 Next, was a beer that Novak brought over a while ago, the Abita 25th Anniversary Vanilla Double Dog by Abita Brewing Company of Abita Springs, Louisiana at 7% abv. 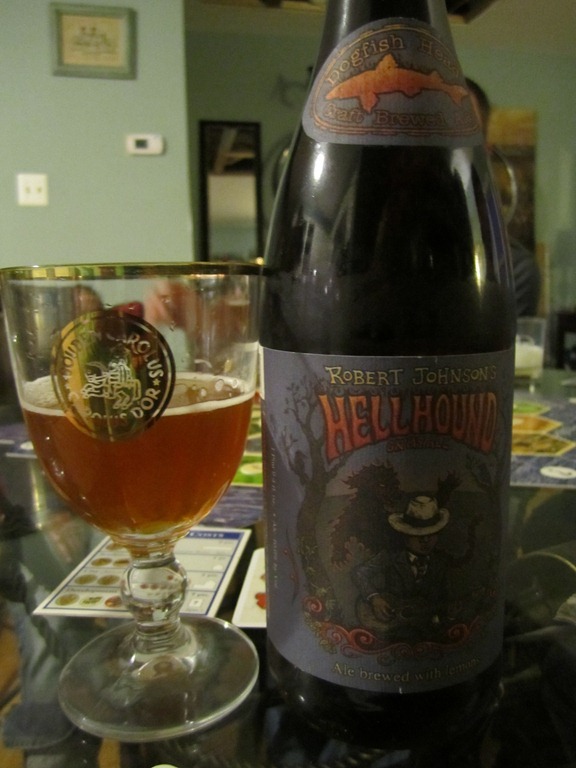 Another beer that Rob brought, the Robert Johnson Hellhound by Dogfish Head Brewing Company at 10% abv. Also the Theobroma by Dogfish Head Brewing Company at 9% abv. 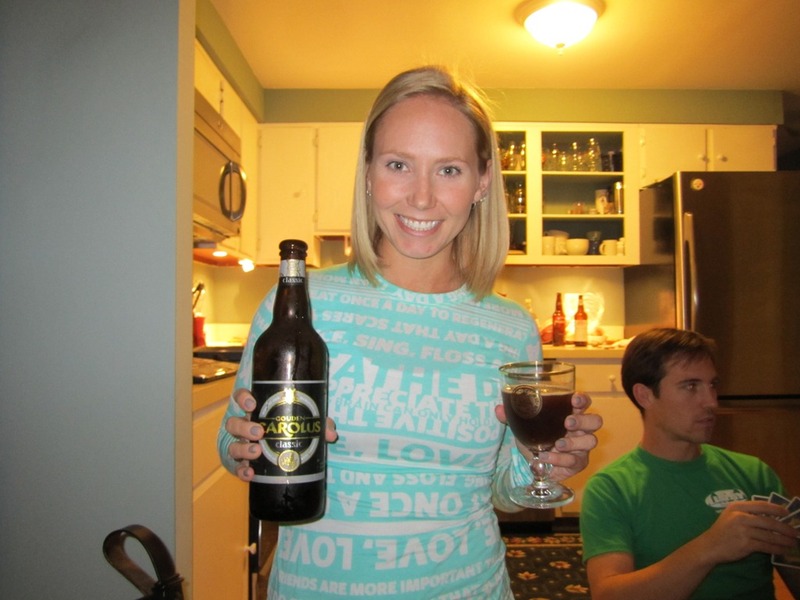 We also all split the Gouden Carolus Classic by Brouwerij Het Anker of Mechelen, Belgium at 8.5% abv. 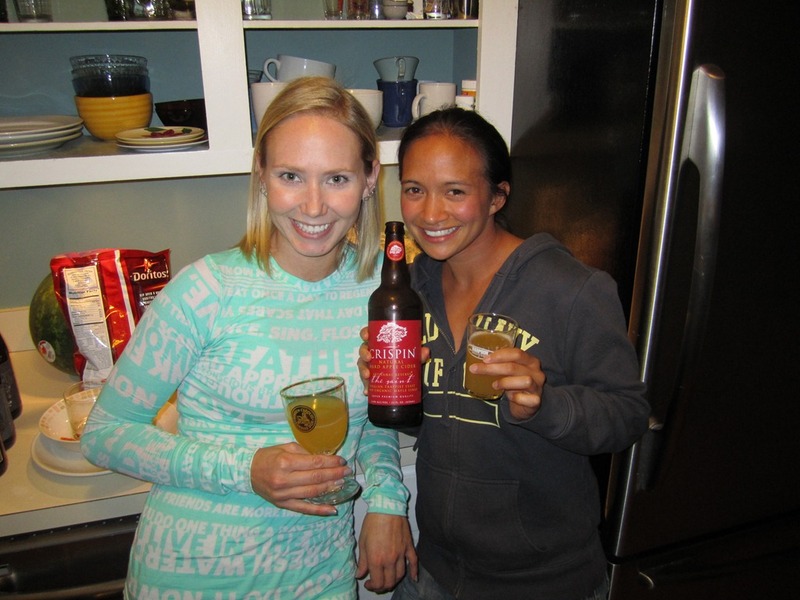 Anna brought over and let me sample Crispin “The Saint” Hard Apple Cider by Crispin at 6.9% abv. 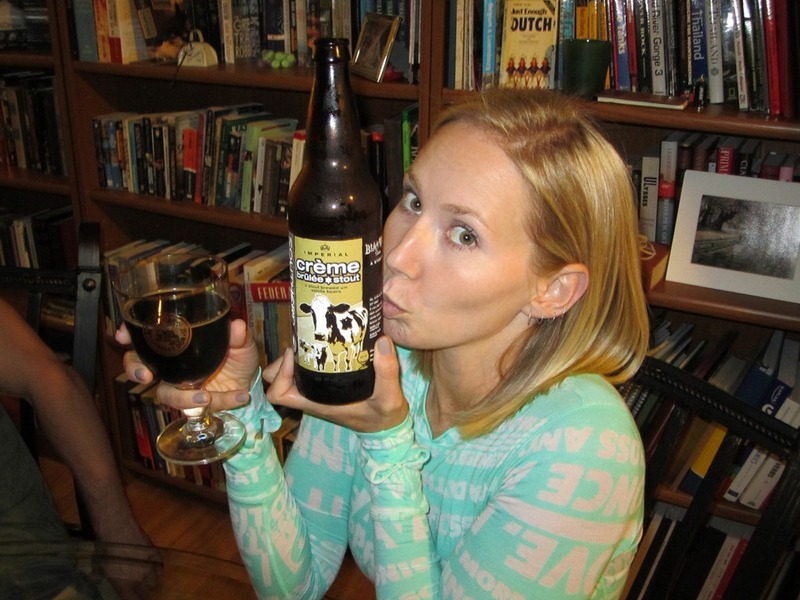 And since I was in the company of so many people who love good beer, I decided to open my last bottle of Crème Brulee Stout by Southern Tier Brewing Company of Lakewood, NY at 9.6% abv. Unfortunately, soon after this I was reaching for a card, bumped my then empty glass and broke it! I was so heartbroken! 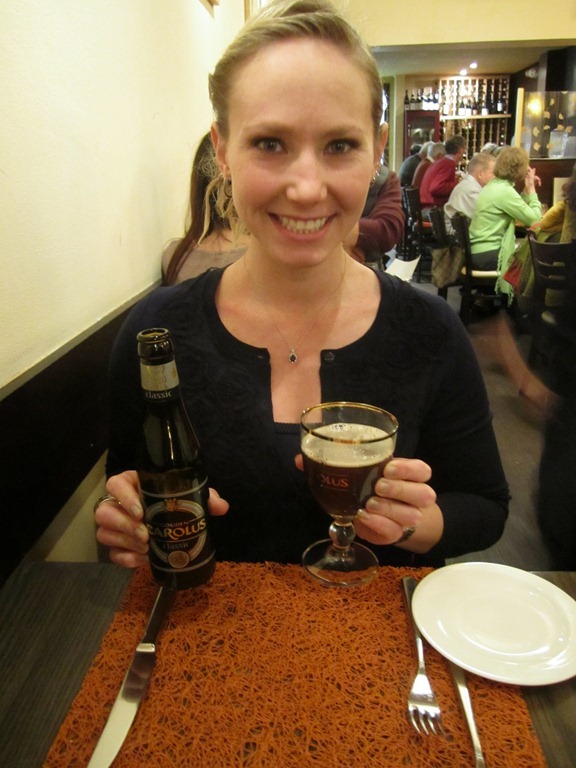 I loved my Gouden Carolus glass! Although, everyone reassured me by saying how very soon I will be able to replace it with a glass that I will have bought at the brewery. And probably because we were a bit drunk and the taste buds were numbed we opened the Baltika #6 Porter by Baltika Breweries of St Petersburg, Russia at 7% abv. At the end of the night I was surprised to see how many bottles we emptied! I think now I’m ready for Belgium!